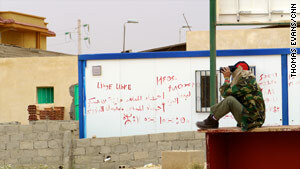 Near the Libya-Tunisia border, a rebel spotter watches rockets strike a few kilometers from the vital crossing. Zintan, Libya (CNN) -- Forces loyal to Moammar Gadhafi have unleashed their biggest attack yet against a rebel stronghold in the mountains of western Libya, one of the Libyan leader's former generals said Friday. The attack began at dawn Thursday, the former commander said. He now commands rebels in Zintan, using the name Hajj Usama. The attack began Thursday when about 150 of Gadhafi's infantry troops began firing on three fronts near Zintan, he said. They were supported by about 40 vehicles, including long-range "Grad" rocket launchers and 14.5 mm heavy machine guns with a range of 6 kilometers. Zintan lies about 90 miles southwest of the capital, Tripoli. Zintan, population 40,000, is at the eastern tip of a 170-mile ribbon of rebel-held mountains that stretch westward from the Tunisian border. After decades in the Libyan army, including a tour of duty in neighboring Chad, Hajj Usama said he now despises his former commander in chief, whom he called a terrorist. "He's never used infantry like this," said the trim, gray-bearded rebel commander. In previous battles, Hajj Usama said, Gadhafi's artillery forces had taken over nearby civilian housing in Zuwail al Bagul and shelled from a distance. Gadhafi's forces simultaneously attacked Thursday on three fronts, Hajj Usama said -- to the north of Zintan, firing Grad rockets into the eastern part of the nearby town of Rayayna, and attacking to the southeast and to the east of Zintan. In response, he dispatched hundreds of fighters to cut off Gadhafi's advance, Hajj Usama said. As of Friday night, one rebel was dead and three were wounded, one of them critically, he said. Fresh trenches cut deep in the stark, red sand here underscore the rebels' readiness to continue defending the town. The absence of Gadhafi's forces has buoyed the confidence of the rebel fighters. Some of the fighters who returned late Friday from the front lines -- crammed into the backs of pickup trucks -- appeared to be school-age. They carried only a handful of weapons, a few hunting rifles and old, bolt-action shotguns. Nevertheless, Hajj Osama said, "they are keen and determined to fight for their freedom." The attack that began Thursday, he speculated, was intended to regain control of Rayayna, population 12,000. Residents east of the town had "declared their support for the rebels a month ago," he said, while the rest of the town remains loyal to Gadhafi and his former head of internal security, Nasar al Mabout. Hajj Usama said al Mabout lives there. Since the raids began, Hajj Usama said, he has lost contact with rebels in Rayayna with the exception of one commander who managed to make the dangerous journey to Zintan after his house was destroyed in the shelling. As dusk fell Friday the shelling visible earlier from the roofs of Zintan abated. But shortly before 10 p.m., the attack resumed with sporadic barrages of gunfire. The rebels said the night shelling may have been intended to terrorize Zintan's residents so they would flee. Some have, but most were staying to brave out the battle they fear is far from over, Hajj Usama said. Early Friday, NATO jets pounded Libyan ports, destroying eight of Gadhafi's warships, an alliance spokesman said. NATO targeted the ships in Tripoli, Al-Khums and Sirte after it was apparent that Gadhafi's forces were increasingly using naval vessels to launch attacks on civilians, said Mike Bracken, NATO's military spokesman. Gadhafi was indiscriminately mining waters in Misrata and hampering the flow of humanitarian aid, Bracken said. "He was using maritime forces to lay mines. These were legal targets," Bracken said at a briefing in Brussels, Belgium. He did not say whether crew members were aboard when the ships were hit. The NATO campaign is progressing and Gadhafi's combat power had been severely curtailed, Bracken said. But the Libyan leader's forces continued their heavy shelling of Dehiba, on the Tunisian border, where thousands of refugees have amassed in recent weeks. The border crossing, through which humanitarian aid is often trucked in, was closed Friday. Along the southern borders, rebels had gained control of border crossings between Libya and Sudan and Libya and Chad and had regained control of Kufra in the southeast, according to a report by the International Medical Corps, which has teams in Libya and Tunisia. The global medical organization said rebel control along the Chad border was significant because supplies flow through there to Gadhafi's forces. "While control of the entire border will be difficult, the rebels are reported to have a large force in the region," it said. "The Niger and Morocco border crossings remain under Gadhafi control." Meanwhile, the African Union announced it will hold a two-day meeting of heads of state in the Ethiopian capital of Addis Ababa next week to address the conflict in Libya, as well as other security issues in Africa. In another development, the family of South African freelance photojournalist Anton Hammerl, who has been missing in Libya since April, said late Thursday they believe he was killed by Libyan government forces. The statement was posted on the "Free photographer Anton Hammerl" Facebook page and followed interviews given in The New York Times, Global Post and The Atlantic by two journalists who said they were with him when he was shot. "On 5 April 2011, Anton was shot by Gaddafi's forces in an extremely remote location in the Libyan desert. According to eyewitnesses, his injuries were such that he could not have survived without medical attention," according to the Facebook statement. Hammerl was last reportedly seen in a remote region of the Libyan desert. He was reportedly captured by Gadhafi's forces near the town of al-Brega, a key oil town in eastern Libya, that has been the site of intense fighting.